The spine-tingling terror from the world of Archie Horror continues as the next epic storyline, “Witch-War”, begins in SABRINA #7 from modern masters of horror Roberto Aguirre-Sacasa and Robert Hack! The events of the first game-changing story-arc have come to a head. Sabrina’s father is back among the living and Madame Satan’s master plan is finally revealed. Will Sabrina’s aunts be able to keep Sabrina safe and what lengths will they go to in order to protect her? “Witch-War” kicks off in September’s SABRINA #7! “WITCH-WAR” Part One (of Six): “The Revenants”: Sabrina’s father, Edward Spellman, is back from the dead, inhabiting the body of the newly resurrected Harvey Kinkle! Sabrina, believing the love of her high school life is back, arranges for a romantic rendezvous—but neither Hilda nor Zelda want that reunion to take place and are willing to start a witch-war to keep them apart! 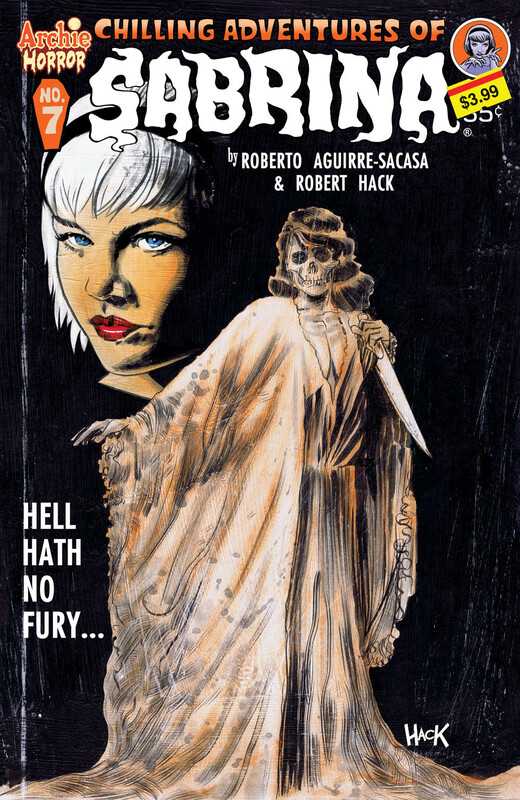 Meanwhile, the diabolical Madam Satan reveals her true plans for the Spellman family… You dare not miss the last page of this masterpiece of the macabre! 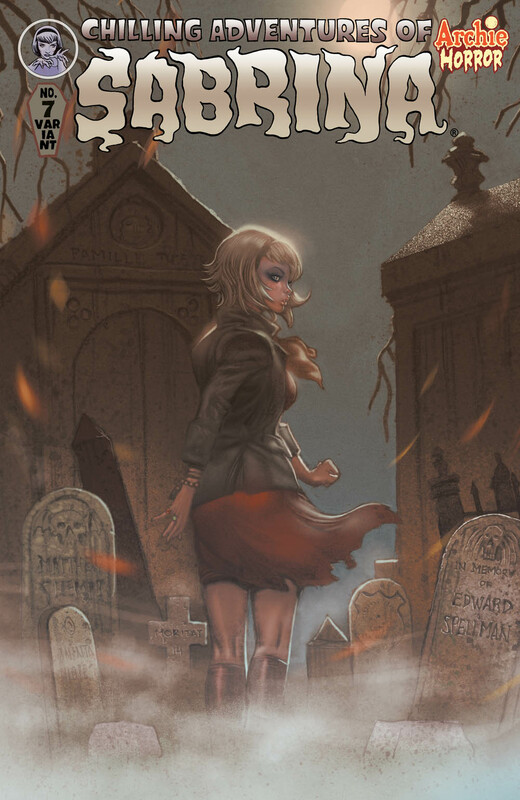 Released in May, the highly anticipated SABRINA #5 featured the stunning conclusion to the first spine-tingling story-arc and is now sold out at Diamond Comic Distributors! The must-have issue will be going back to print with an all new cover by Robert Hack, available in comic book stores on July 13th. Also arriving in comic book stores on July 13th is SABRINA #6, the perfect jumping-on point for the series. SABRINA #6 will be an over-sized issue as Aguirre-Sacasa and Robert Hack reveal the dark history of how Salem came to be and serve Sabrina. Sabrina. This chapter lifts back the cloak of time to reveal the dark history of how Salem came to be and serve his master. For TEEN+ readers.